Ewa Battlefield: Did Dec. 7, 1941 Pearl Harbor Attack Architect Isoroku Yamamoto Tour Hawaii Military Bases In 1933? Did Dec. 7, 1941 Pearl Harbor Attack Architect Isoroku Yamamoto Tour Hawaii Military Bases In 1933? In 1933 there was an exhibition event on the island of Oahu known as a gymkhana ("a multi-game equestrian event to display the training and talents of horses and their riders") which was held at the major US Army base of Schofield Barracks. In 1933 horses (and mules) still played a major role in Army field operations, -cavalry, towing artillery, recon, etc. 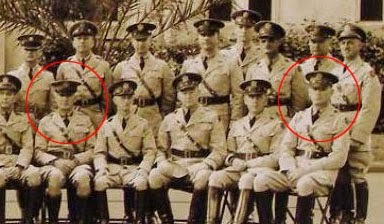 Based upon analysis of a 1933 photo showing Imperial Japanese Naval officers visiting this event and being shown a transit device (theodolite?) 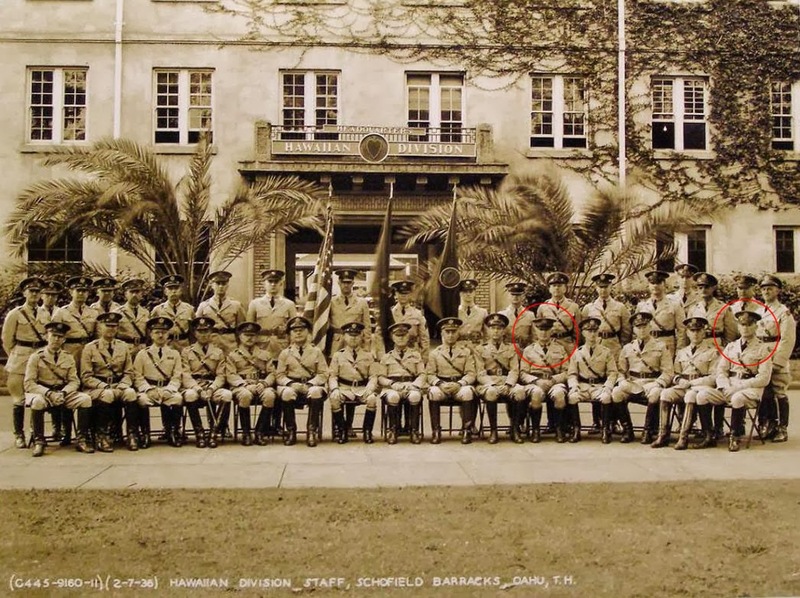 there is an IJN officer in the center of the photo who shows a remarkable resemblance to Isoroku Yamamoto. A study of a later picture of Admiral Yamamoto shows nearly identical facial features- ear, nose, chin, lips, etc. I have for years always thought this WAS a picture of Yamamoto in Hawaii but didn't have any resources to search it further. Currently I am having this checked out to see if my facial analysis is correct. However, his history says he would have been a Rear Admiral by 1933 and 49 years old. I don't yet know if this is what his rank is in this photo, but the face and the forward personal bearing of this individual sure does indicate a leader and someone very comfortable in the presence of a US military officer. Where was Isoroku Yamamato in 1933? "From 1919-1921 he studied at Harvard University. Promoted to Commander upon his return to Japan he taught at the staff college before being sent to the new air-training center at Kasumigaura in 1924 to direct it and to learn to fly. From 1926 to 1928, he was naval attache to the Japanese embassy in Washington. He was then appointed to the Naval Affairs bureau and made Rear Admiral, he attended the London Naval Conference in 1930. Back to Japan he joined the Naval Aviation bureau and from 1933 headed the bureau and directed the entire navy air program." Could this have been Yamamoto in Hawaii? It would have been very much like Yamamoto to have been very interested in Hawaii and especially the island of Oahu and the layout of its military bases. If this IS Yamamoto in Hawaii - there is even more to this Pearl Harbor chapter that isn't yet fully known. We shall see where this leads! "Isoroku Yamamoto was born in 1884. Yamamoto graduated from the Japanese Naval Academy in 1904. He fought in the Battle of Tsushima Straits in May 1905 where Yamamoto lost two fingers on his left hand. " Because most of these IJN officers appear to be wearing gloves, this key clue as to whether this is Yamamoto or not is not discernible. While he had served in America, Yamamoto developed a negative attitude to the American Navy and the standards he had witnessed within it. He described the American Navy as a club for golfers and bridge players. However, for all this disdain, Yamamoto was aware of the vast power that the US Navy had - especially in the Pacific. 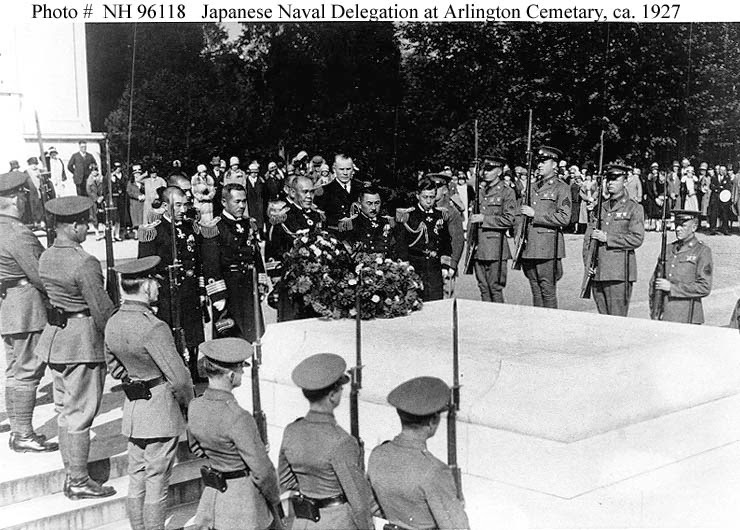 CAPTION: "Japanese Vice Admiral Osami Nagano lays a wreath at the tomb, circa 1927. At the right end of the Japanese delegation is the Naval Attache to the United States, Captain Isoroku Yamamoto." Throughout his career, Yamamoto had opposed many of Japan's military adventures, such as the invasion of Manchuria and the ongoing war with China. In addition, he was vocal in his opposition to any war with the United States, and delivered the official apology for the sinking of USS Panay in 1937. These stances made the admiral very unpopular with the pro-war factions in Japan, many of which put bounties on his head. On August 30, 1939, Navy Minister Admiral Yonai Mitsumasa promoted Yamamoto to commander-in-chief of the Combined Fleet commenting, "It was the only way to save his life - send him off to sea." On the evening of Jan. 30, 1933, Adolf Hitler, the newly appointed Chancellor of Germany, stood in a government building at an open window watching a torchlight parade of 25,000 Nazi troops march through the streets of Berlin. Thousands of Germans cheered as they marched by, and Hitler was giddy with delight. "No power on Earth will get me out of here alive."